Roger owns a 2017 380 LXF Scout with a beautiful black hull. As other boat owners with colored hulls understand, they can look amazing, but they can be a real pain to keep clean. Roger had recently learned about the benefits of ceramic coatings, but like many consumers, he didn't know how to select the best ceramic coating for his boat. 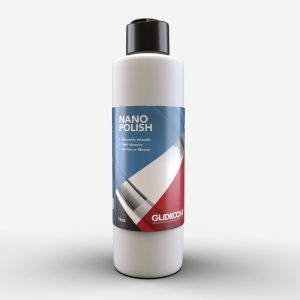 As ceramic coatings become more popular in the marine industry, many companies and detailers are starting to provide ceramic coatings as an alternative and better solution to wax. While it is always good as a consumer to have options when making a purchase, it is important to know a few things when trying to select the best ceramic coating for your boat. 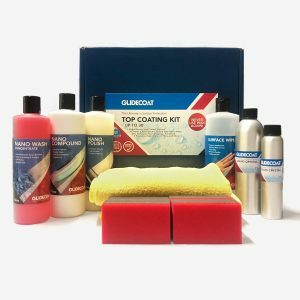 Ceramic coatings have been around for over 10 years in the automotive industry, and it is only recently that they have gained traction in the marine market. Given the origins of ceramic coatings, many companies that offer an automotive ceramic coating have begun to offer a marine coating. 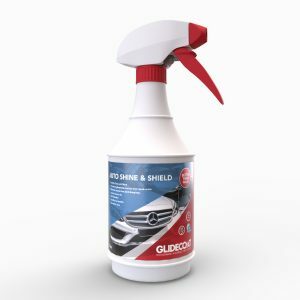 In many cases the marine coating will be the same or very similar to the automotive. These coatings will work to an extent, providing high gloss and a hydrophobic surface, but they will not last in a marine environment. • The different type of surface - painted aluminum is a less porous surface than gel coat and painted fiberglass. As a result, the percentage of solids for the ceramic coating must be greater, to fill in the pores of the gel coat and painted fiberglass. • Higher exposure to UV damage - have you ever noticed how tired you are after a day out on the boat and reflection of UV rays from the water. Just think how your boat is consistently battling that challenge, day in and day out. This exposure is more intense than what your car experiences. As a result, the ceramic coating must be stronger to protect from sun damage. 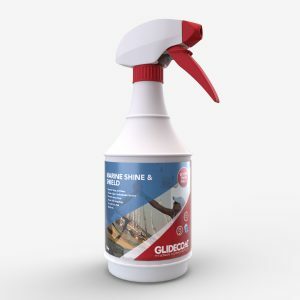 At Glidecoat, we have tested, developed and optimized our coatings to perform best in the marine environment, ensuring our customers will get a coating that lasts, backed by our 18 month warranty. This is a key factor when trying to choose the best ceramic coating for your boat. Before reaching out to Glidecoat, Roger had his local detailer working on the boat. His detailer was applying a competitive ceramic coating to the black hull of the 38 Scout. After learning more about the product that was being put on his boat and not a ceramic coating optimized for marine, Roger had his detailer stop the project. He then reached out to Glidecoat, to have us remove the existing ceramic coating and complete the project with Glidecoat's Ceramic Coating. Even newer boats suffer from salt deposits and hard water marks. After washing the hull, the gel coat was covered in salt that had worked its way into the pores. Before any restoration process, the gloss meter readings were very inconsistent. Readings were as low as 59.6, with the highest reading in the mid 80's, including the areas previously coated with a competitive product. Ceramic coatings are a great solution to protect the boats surface from the harsh elements, repelling UV rays and not allowing salt and acid rain to penetrate the pores. When a boat is treated with a ceramic coating, the surface becomes very hydrophobic. This allows you to simply hose the boat down with water, rinsing away the salt, dirt, or fish blood from the surface. When we arrived at Roger's boat, the black hull was covered in salt. 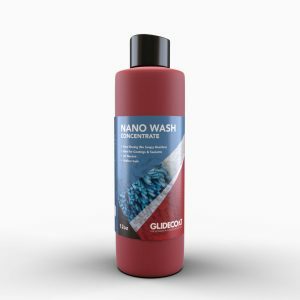 We began to wash the boat with Nano Wash to remove the salt, allowing us to see the real condition of the gel coat. It was easy to find the areas that had been previously coated with the competitive coating, based on how the water acted on the surface. 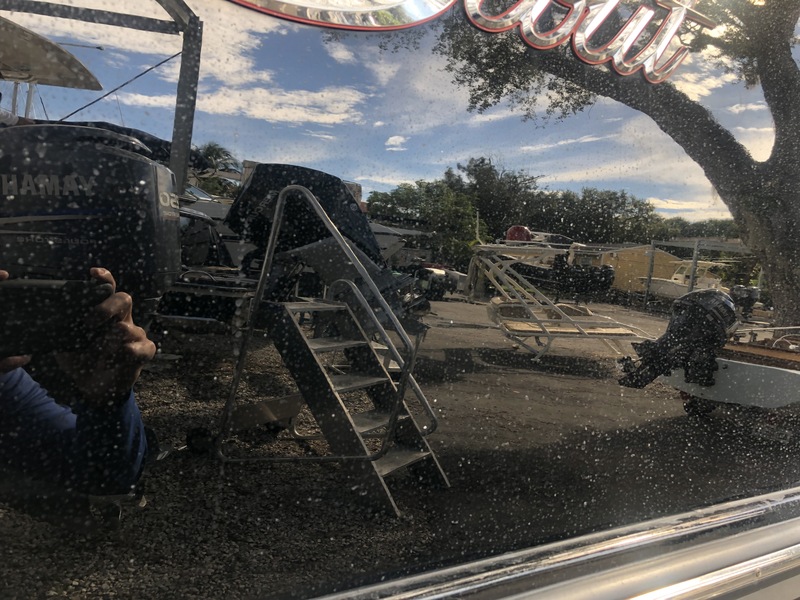 The surprising thing that we found after washing the boat was the amount of salt deposits in the gel coat, across the entire hull, even the areas coated with the competitive ceramic coating. These salt deposits are where salt penetrated the pores of the gel coat, creating hard water marks that are extremely detrimental to the surface and difficult to remove. 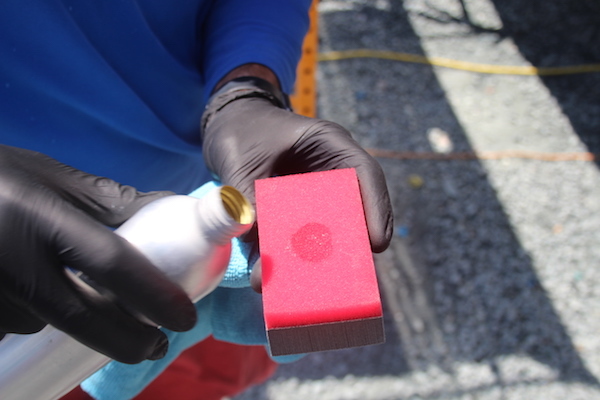 It was clear that the coating previously used was not strong enough to withstand these harsh conditions. In order to remove the salt deposits, we used CLR, to flush out the salt from the pores of the gel coat, which could not be fully achieved from buffing. Before the surface restoration we used a gloss meter to measure the shine of the surface, on areas coated with a competitive product and the non coated areas. Those areas of the hull which had been coated previously averaged in the low to mid 80's, which was not that much higher than some of the non-coated areas, although there were non-coated sections that averaged in the high 50's. Once the surface was free of salt and the hard water marks, we began the removal of the previous ceramic coating and surface restoration. Note most ceramic coatings come off through abrasion (buffing), whereas some require wet sanding. 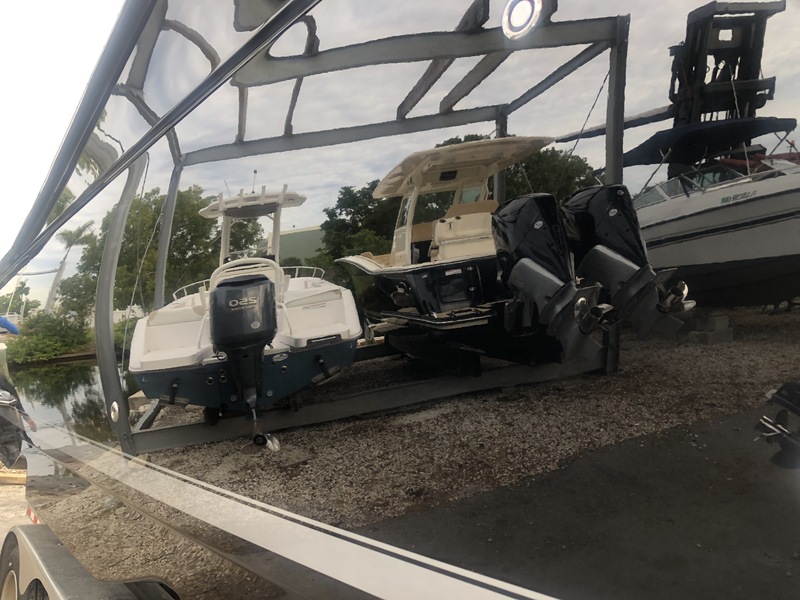 When dealing with a newer boat with little to no oxidization, our main goal in the surface restoration step is to remove any minor surface imperfections (scratches, water marks, etc) while increasing the gloss of the gel coat. 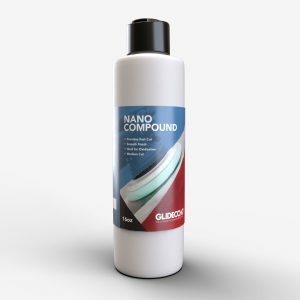 We used our Nano Compound with a light cutting foam pad to remove the leftover water marks and bring an added depth to the gloss of the black hull. At this point, we have finished the restoration process to bring back the shine and color of the hull. 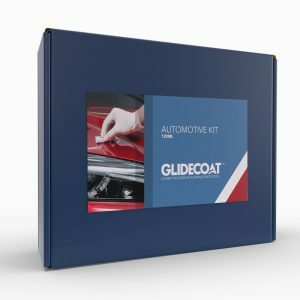 Before applying our gelcoat ceramic coating, we use Surface Wipe, our version of a denatured alcohol to sterilize the surface and ensure all contaminants are removed from the surface. After the curing process, the hull of the boat looks like glass! A little goes a long way! Surprising how a little of product can go a long way. When applying the coating to a 2' by 2' area, you should pour approximately the size of a penny on the applicator sponge. Once finished, the shine and finish of the black hull is second to none! Before beginning the Glidecoat Ceramic Coating process, gloss meter readings ranged from as low as the 50's to the mid 80's. 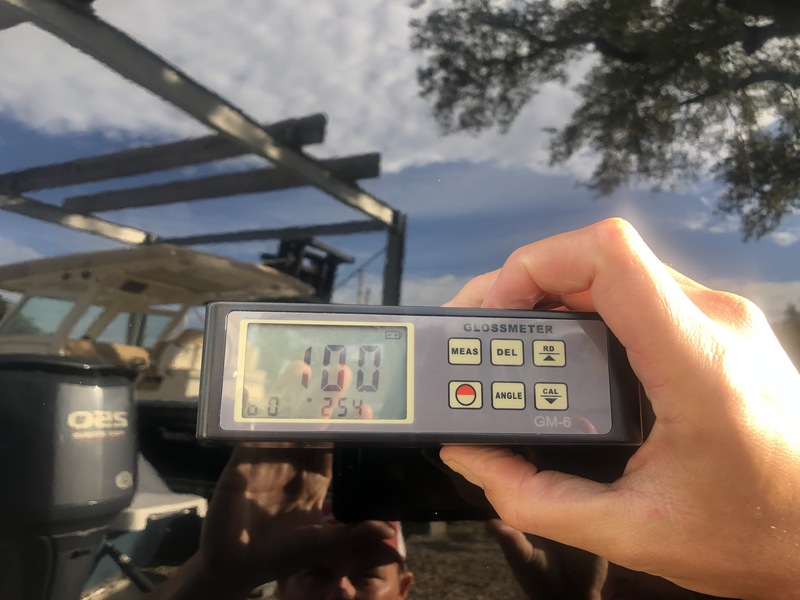 After the Glidecoat process, we had gloss meter readings as high as 100!, which ties the highest reading we have ever seen on a boat! Not only does Roger's boat have an unbelievable shine, it is now protected with the best ceramic coating for marine! Roger can now enjoy the beautiful look of his black 380 LXF Scout without having to worry about constantly washing and having it detailed every 60-90 days here in Florida, to keep it looking great! Before having a ceramic coating applied to your boat, make sure to call Glidecoat. 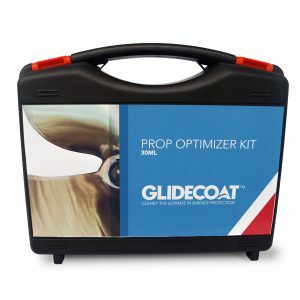 Click Here to reach out to the Glidecoat team to help you on the best way to protect your boat. 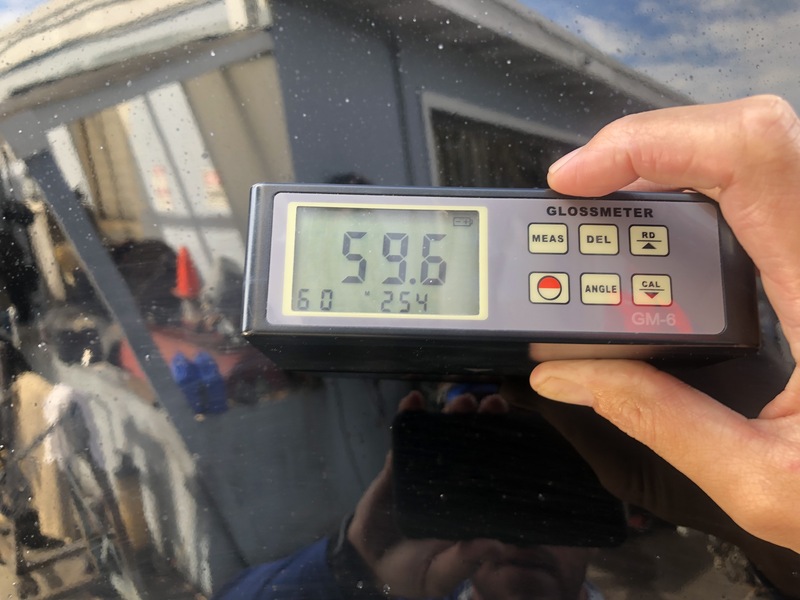 After complete restoration process to the gel coat and applying two (2) coats of the Glidecoat ceramic coating, we took gloss meter readings to measure the change. The gloss readings climbed from as low as 59.6 to a whopping 100! This is the highest reading we have ever achieved on gel coat. After coating, the depth of gloss in the hull was simply amazing! The hull has a mirror like finish, allowing you to perfectly see the boats in the background.